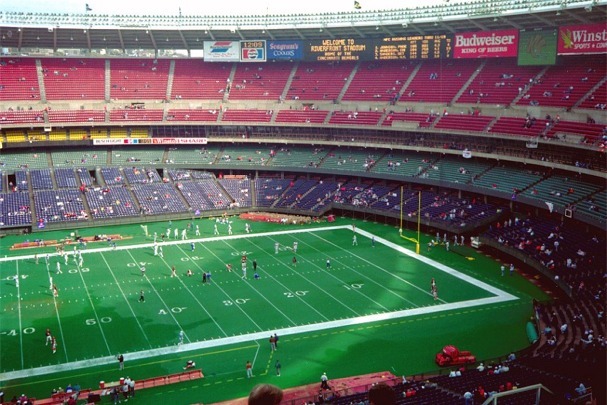 Riverfront Stadium, home of the Cincinnati Bengals for nearly 30 years, was one of the NFL’s most boring stadiums. During the mid 1940s discussion began on the possibility of building a stadium along the banks of the Ohio River. By the 1950s, the Cincinnati Reds (MLB) became unsatisfied with their home, Crosley Field leading the City of Cincinnati decided to build a multipurpose stadium in the late 1960s. After an agreement was reached to build a stadium, the American Football League awarded the city a franchise in May 1967. Construction of the stadium along the riverfront began on February 1, 1968. A multipurpose, circular “cookie cutter” stadium was completed by July 1970. The Cincinnati Bengals played their inaugural first game at Riverfront Stadium against the Oakland Raiders on September 20, 1970. Over 60,000 fans filled Riverfront Stadium during the opening game. Four tiers of multicolored seats circled the entire Astroturf playing field. The Bengals shared the stadium with the Cincinnati Reds (MLB). The conversion process from baseball to football was relatively simple. The lower field box seats for baseball from home plate to the left field foul line were moved on tracks so the field could be turned into a football gridiron. The scoreboard was located below the rim of the stadium roof. Fans entered the stadium on the plaza level and had to walk down ramps to get to the field (blue) level of seats. The stadium was surrounded by a large three level parking garage that could accommodate 2,500 cars. 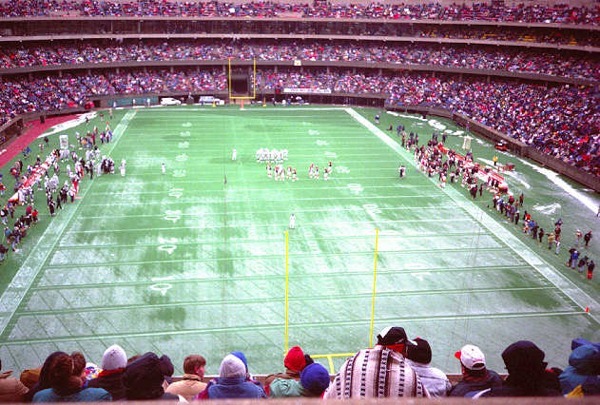 Riverfront Stadium changed very little throughout the Bengals tenure with the exception of the stadium being renamed Cinergy Field in 1996. By the mid 1990s both the Reds and Bengals wanted their own separate stadiums. Voters approved a referendum that allowed construction of new football and baseball stadiums in 1996. The Bengals new stadium, was constructed along the Ohio River, just a block away from Riverfront Stadium. On December 12, 1999, the team played their last game at the stadium. The Bengals moved into Paul Brown Stadium the following year. The Reds continued to play at Riverfront Stadium/Cinergy Field. In order for their new ballpark to be built, over 14,000 seats were removed from Cinergy Field before the start of the 2001 season. The Reds moved out of the stadium after the 2002 MLB season. Riverfront Stadium/Cinergy Field was imploded on December 29, 2002.